Join director Melissa Hacker and NPR journalist Uri Berliner to watch and discuss the first documentary film to tell the heart-wrenching story of the Kindertransports. After the screening, Hacker and Berliner will talk about how the Kindertransport affected their own family histories. My Knees Were Jumping premiered in 1996 at the Sundance Film Festival, and went on to screen in film festivals, museums, Jewish Community Centers and universities throughout the world, including a sold out limited theatrical run in New York City. In the nine months just prior to World War II nearly 10,000 children were sent, without their parents, to Great Britain from Nazi Germany, Austria, Czechoslovakia and Poland. 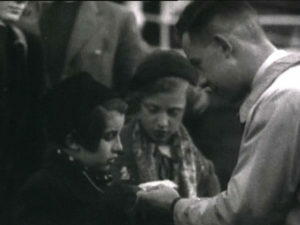 These children were rescued by the Kindertransport movement. Most of the children never saw their parents again. Those courageous parents who had the strength to send their children off to an unknown fate soon boarded transports taking them to concentration camps. The filmmaker’s mother, the Academy Award nominated costume designer Ruth Morley (Taxi Driver, Annie Hall, The Hustler, The Miracle Worker, Tootsie, and many more classic American movies) fled Vienna on a Kindertransport in January 1939. The story of the Kindertransports is an extraordinary piece of history – untold far too long. The children who lived the trauma and terror of being uprooted from secure homes tell amazing stories. Into the darkness of the Holocaust it is important to add true tales that are life affirming. This event is co-presented with Yeshiva University Museum in conjunction with the exhibition Kindertransport: Rescuing Children on the Brink of War.